This week’s adventures took me back to New York. Starting at the Statue of Liberty and ending in Time Square, it was a full day of exploring. Visiting the Statue of Liberty started with the ferry ride to get there. It was a little cold and windy, but seeing the city skyline open up and the statue getting closer definitely made standing out on the deck in the cold worth it. 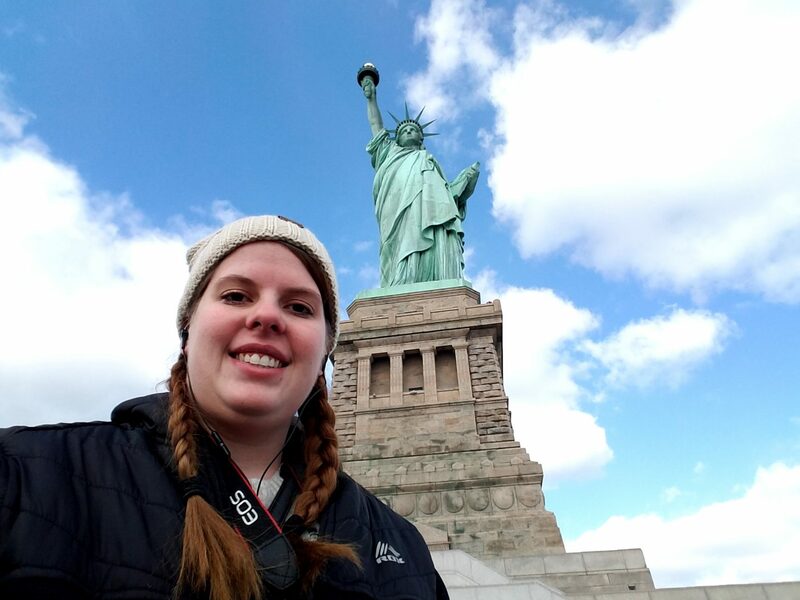 The island that the Statue of Liberty is on was a lot bigger than I was expecting it to be, and there were so many other things that I learned about the Statue of Liberty and its history that I didn’t know or expect either. I learned that the Statue of Liberty was built on top of a military fort and has an Eiffel tower inside of it. I learned that while the statue was a gift from France, the United States provided the pedestal. I learned about the role Pulitzer played in making sure the pedestal was funded. There was so much I didn’t know about the Statue of Liberty, and getting to see her up close and learn so much about the history and significance of the whole thing was really neat. After the Statue of Liberty, I visited Ellis Island and the immigration museum. While I don’t know of anyone in my family that came through Ellis Island, it was still really interesting getting to see how so many people first came to America. Seeing exhibits on why people moved and how they got here was really neat, especially since the reasons why people move hasn’t really changed. It was also a little surreal to see photos of the buildings on Ellis Island throughout time. It’s hard to believe that something that once was so important, could be completely abandoned for years before being recognized as important again and being restored. Hearing so many stories of experiences from Ellis Island and how little people came with for just the hope of a better life was really inspiring. Once I was back in Manhattan, I went to Federal Hall. Being in the same place where George Washington took the first oath of office and where so many decisions about the founding of this country were made was really cool. From the first home to the executive and judicial branches of the country to a sub-treasury and huge banking institution, federal hall was definitely a neat building with a ton of history packed in. I made a few quick stops at some other attractions before my final big stop. I saw the fearless girl statue (and the bull). I stopped at Trinity Church and graveyard. I saw the Thurgood Marshall courthouse and the New York County Supreme Court, and then I made my way to my final big stop of the day: the African Burial Grounds National Monument. I had no idea the history of the African Burial Grounds site, but being a National Park Service site put it on my list of places to go. It was a seemingly small monument site, and the outdoor grounds were closed for renovations, but the museum and videos inside the monument were just as inspiring and impactful as the Statute of Liberty and Ellis Island. The African Burial Grounds monument marks the burial site of over 15,000 slaves all buried with love and care. The monument represents a history that was taken from so many people. It represents the lives of the people who built New York and the United States into what they are today. As one of the commentators in the video said, this isn’t black history, it’s American history. The burial grounds were something that I hadn’t known about before, which I think is a huge shame because the story and significance should be taught to everyone in this country. Archaeologists have called the discovery of the burial grounds the most significant find in the 20th century, and yet it isn’t common knowledge that it is there or even that it is significant. I loved getting to learn about the burial grounds, and I really hope that someday everyone will know about their significance and place in American history. After the burial grounds, I finished my evening in Time Square and caught the train back to New Haven. I only did one day of exploring this week because I spent the other days I had off really planning for a few upcoming adventures. Some of those adventures even required a little bit of shopping to get ready for them. It’s going to be a tight squeeze to fit in everything I want to do in the next couple of months, but I’m looking forward to the adventure.